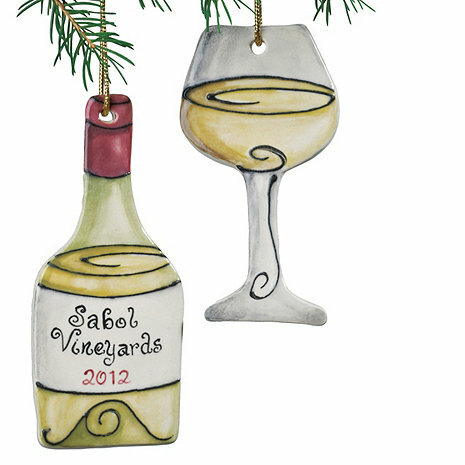 Befitting the most fabulous fetes, these handpainted ceramic ornaments are one of a kind, artisanal treasures suspended from golden strings to adorn wine bottles, napkins, give as gifts, hang from trees. Personalize the Wine Bottle with up to 12 characters for each of the 2 lines and 4 digits for the year. Befitting the most fabulous fetes, these handpainted ceramic ornaments are one of a kind, artisanal treasures suspended from golden strings to adorn wine bottles, napkins, give as gifts, hang from trees. Personalize the Wine Bottle with up to 12 characters for each of the 2 lines and 4 digits for the year. Please allow 3 to 4 weeks for delivery. Dimensions: 5"H x 2"W x 1/4"D.
I ordered these and was not disappointed when they came. They were done well, great quality. Heavy but not to heavy, the lettering was spot on and I could not have asked for more. It also did not take long to get them, considering I ordered them close to Christmas.